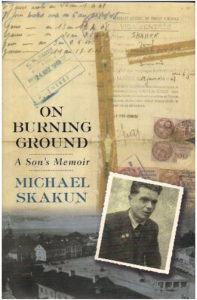 “On Burning Ground” traces how at the height of World War II, Joseph Skakun, a devout blond-haired European rabbinical student steeped in a legendary form of ethical piety, as well as trained in the analytic rigors of talmudism, adopted multiple religious and ethnic identities, including those of a Christian and a Muslim, to survive. The story culminates with his desperate gambit at life – his entry as a volunteer recruit into Hitler’s Waffen-SS, the most feared and fearsome of Hitler’s fighting divisions. The Washington Post went on to say: “To assume a fake identity is not so strange; spies and lesser impostors do it all the time. But for a devout yeshiva student to invent a combination of false selves through which he not only escapes the Nazi death camps but actually ends up as a recruit for the Waffen-SS – now there’s a definition of chutzpah (nerve).” After the war, the wheel comes full circle as Joseph Skakun, in a post-traumatic fog of anguish and doubt, manages to return to his ancestral faith first in Paris and then in New York.